Wow, nice snippet!! Title: Family with a Bird. Not good, I know, but I can't concentrate it seems today. Not fourteen... :) I was the same! All of my friends wanted to be hairstylists, but I had zero desire! "That bird is going to eat my bait." Trina shook her head and laughed. 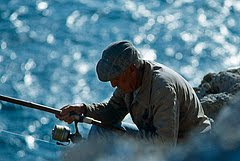 The old man sat on the same rock every morning, and whenever she passed him, he claimed her bird would eat his bait. Old coot. "Has he ever eaten your bait?" "He might. He's eyeing it." She crouched and sat on the rock next to him. "Do you want to hold him? He'll sit on your shoulder." The man tipped his hat up a fraction and stared. Trina almost gasped at the intensity of his pale blue eyes. She smiled. "Ahh...but birds like you." Eileen, Nice & simple. Thanks for throwing one out. Jill, It made me happy to read yours. I felt as a hairdresser might as she looks over at the French twist her co-worker just secured in place. I eat this stuff up. Nicely done. Sitting on the rocks, a pole in one hand and a wrinkled photo in the other, Sam thinks back to the day the picture was taken. Gabby had begged him to take her to New York City for her eighteenth birthday. On any other day, he would've given her what she wanted, no questions asked. However, her birthday was on New Year's Eve, and Sam loathed crowds. Gabby's persistence paid off, and off they went to the Big Apple. He rubs the picture with a finger, tracing the outline of her face. 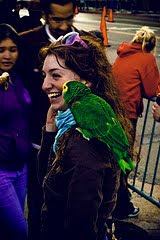 He remembers fondly how she laughed when the street performer placed the bright green bird on her shoulder. Sam had snapped the photo, a memento of their trip together. He thought of how Carolyn would've loved to have been there, and how she'd want to be here today. "Time to get ready, Daddy!" Gabby calls to her dad from the house. "I can't be late on my own wedding day just so my dad can try to catch the big one!" Sam smiles and starts up the rocks back toward the house. Wow, great flash stories here! I thought Beth's was so moving. Here are a few titles that might match up ... "Wings of Time." Or how about "Fly Away Home." Wow, I love these pics and how they emote certain feelings. Really great. I want to write a story about them, just by looking. Love your dialogue exchange. My brain is just not working well enough today to come up with anything. I'm going to come back later and see what everyone else came up with though. Thomas was feeling alone today, more than usual. His face was sullen. His tears dried from last night's cries. "I'm lost without her." He wondered if he would ever find joy again after the death of his loving wife. "Why did the good Lord take my angel so soon?" he thought, "thirty years is just not enough time." His passion for fishing was the only escape he took refuge in. But even now, as he sat in his small boat, bait on hook, he found no comfort. After a long day and little to show for it, he securely tied his boat to the dock, packed his gear and headed home. The rain had stopped. He watched the dark clouds dissipate and listened to the laughter of the crowds on the boardwalk. With his face to the ground and heart breaking, he held back tears and whispered to the heavens. "What now, Lord? How can I ever find solace in anything? When will my heart smile again?” He continued walking the boardwalk towards his empty nest; towards the echo of her voice haunting him, even after two years. He wondered if he’d ever see the beauty of life once more. Marie walked passed him, slightly brushing his arm, interrupting his thoughts. "Excuse me, Sir" Marie exclaimed, "I hope I didn't scare you." Marie noticed Thomas' sadness and asked, "Is everything okay? Sir, are you okay?" Thomas lifted his head, breathed deep, and hid his pain. "I'm fine young lady, just fine" he said, all the while staring at the parrot on her shoulder. Marie smiled at him, not wanting to pry anymore and continued to walk towards happy children wanting to touch her parrot. From afar, Thomas watched as she engaged with the playful children yet all he could truly see were the colors of the rainbow and he smiled. His prayer was answered by the beauty of a mesmerizing bird. It was God's sign of his love. He realized that he wasn't alone, that the good Lord was still with him. On that day, Thomas acknowledged that life had not died with his sweet Caroline, that there was still beauty in the world, if he but only stop and wait for it. Sorry Wendy, not much dialogue,:) but that's all I came up with. Hey, Wendy! My brain isn't working so well today so I'm content to read. I enjoyed all of the stories! This was a great idea! "You know Squawk was my bird first," he said to nobody outloud. The old man reeled in his last cast for the day. "She loved me first, she did," he mumbled under his breath. "I can still take care of her, I will remember to feed her, I promise." The old man got out of his tethered boat next to the pier. The man looked and saw his daughter with Squawk on her shoulder. "Dad, come on in now, supper is ready. Be careful of the steps, remember there are four of them." "I remember, now what is your name again?" Quick response tonight. I'll start with: I really hope these keep comin' b/c it has been wonderful to read them. All day I kept thinking iron sharpens iron. I think this relates to writers as well. Very moving starts to stories. "Sir, you see this bird sitting on my shoulder?" "Don't you think Id've mentioned something before now if that bird was mine?" "You think I look like a man who'd own a fancy bird?" "I'm just trying to find its owner." "Well, I ain't it. I don't own no bird, lady." The old man bent over his tackle box and baited his hook. "What? It just come and land on your shoulder out of nowhere?" "He was hopping along the shore over there." "Sure never thought I'd see a parot on my shore." The man straightened, cast his line. "Why don't you go put him back?" "Lady, that bird just pooped on your shoulder." Okay, that was the most random writing ever. Randomness headed nowhere, apparently. But it was still fun. Your Barbie story reminded me of how I shaved one of my cousin's Barbies once. I called her trailer trash Barbie. She was shunned by the popular barbies. What kid makes that kind of stuff up?